Blessed are the hands that script good news - publishing peace and salvation, each time they hit "publish" and share their scripture art on social media. Welcome back to our ongoing series, Interview with a Renaissance Mom. 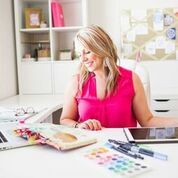 Today I get to introduce you to one of my favorite lettering artists, Krystal Whitten. Y'all are going to love this sweet creative mom. So let's get on with it and invite Krystal to share with us a bit about how her family life and faith life and flourishing creative life all work together in this mothering season. I trust that you'll be blessed! Hey, I’m Krystal Whitten. I was born and raised in the South and currently live in Tampa, FL with my husband Andy and our two children, Pierce (6) and Haven (4). Since it’s summer, my days are full of pool time, Paw Patrol, and popsicles. Ever since my son was born, I’ve had the opportunity of being a stay-at-home mom with a sprinkling of freelance design on the side. But then hand lettering lit me up on the inside, and I discovered a powerful connection between my art and my faith. 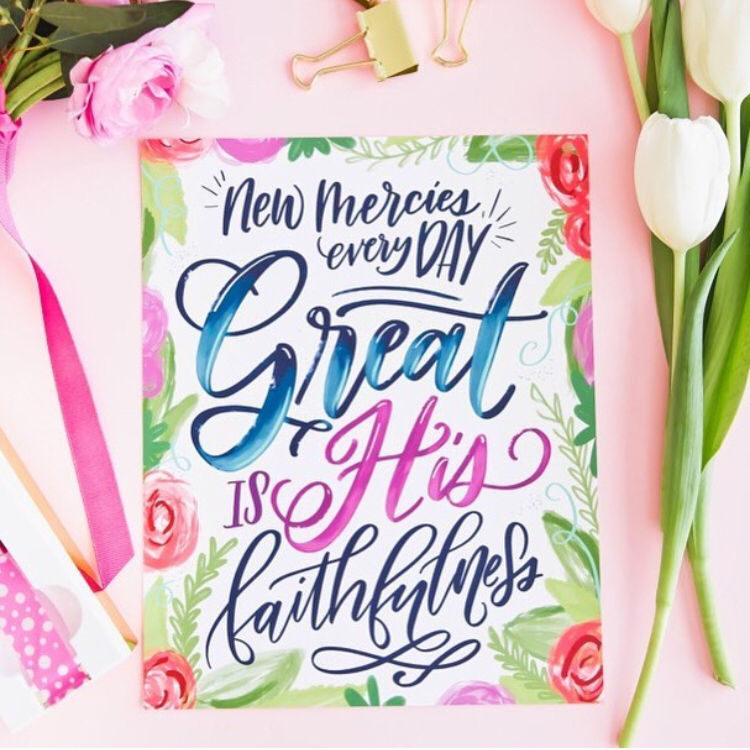 Within a few short months, I shut down my freelance design business and started working on Scripture art full time. I use “full time” loosely. Meaning, every spare second I had, I worked on improving my craft. 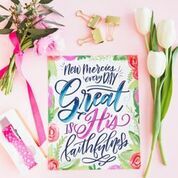 A single idea to hand letter a verse for my guest room has turned into a line of greeting cards, art prints, and a prayer journal that point people back to the timeless, life-giving words of Scripture. As a work-from-home mom, there have certainly been times I longed for a quiet office and 8 full hours to work on projects. God is forever molding me, shaping my attitudes and focus. I’m grateful now more than ever for the opportunity to enjoy my kids and relish their sweet hugs. At Life Creative we believe that life (and therefore art) morphs as a woman transitions from season to season. This is especially true of creative personalities. What did your creativity look like as a child, throughout school, or into your early adult years before motherhood? And what shape does it take today? I’ve always had a bent towards creativity. But I struggled with comparison and thought my talents were “less than.” Ultimately, that kept me from pursuing any serious art classes. In school I always enjoyed playing with my handwriting. I spent hours practicing the alphabet in order to change my own style of writing. I drew quotes and verses with markers in fancy bubble letters and taped them to my walls. In college, I traded in my markers for a Mac and spent the next 10 years on a computer doing graphic design. My first business was designing custom invitations for weddings, parties, and showers, and I loved creating party decorations to fit a theme. I've dabbled in everything from sewing to embroidery to painting furniture to upholstery to making pallet signs. But hand lettering was the hobby that captured my heart and wouldn’t let go. It’s the only thing I’ve done that's never felt like work. In the early days of freelancing, I worked during nap time. That bought me about 4 hours a day to devote to my projects, and that time was golden. As my children have grown, I’ve had to be flexible and realize that my work time will look different with each stage. My daughter, bless her, still takes naps at 4 years old. So I eek out 1-2 hours of work while she naps and my son has “quiet time.” He spends a bit of time playing or reading, and I’ve also learned to welcome him into my office to color or draw beside me. In this season, I’ve also learned to do activities together in the morning hours, and then in the afternoon I don’t feel guilty letting them watch a couple shows while I squeeze in an hour of creative time before dinner. This fall, they will both be in school, so my work time and family time will have more distinct boundaries. Regardless, it’s a process I’m constantly praying God will help me with because the balance is hard. 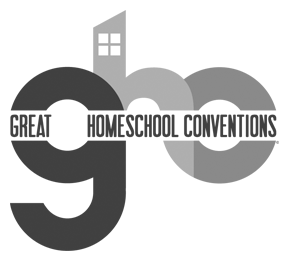 We believe that God purposed our creativity to be one of the vehicles through which we respond to the Great Commission call on our lives. How has God given you opportunity to share His love with others through your creative gifts? Two years ago this month I created an Instagram account for my newfound hobby, hand lettering. I wanted to practice lettering and share the goodness of the Lord at the same time. I created the hashtag #letterfortheLord because my main purpose for sharing my lettering was to make much of Him. I also began to a share my heart very transparently about my own struggles and spiritual growth. That seemed to strike a cord with people. Sometimes it was scary to put myself out there so openly, but God has blessed the obedience. People will message me and tell me how these posts have inspired them to get serious about the Lord and pursue knowing Him on a deeper level. That’s so humbling to hear. God has opened doors for me to share lettering and faith with thousands of people on social media as well as teach lettering classes in my home church and community. He’s inspired me to host Instagram lettering challenges with Scripture themes around the Gospel message and the promises of God. 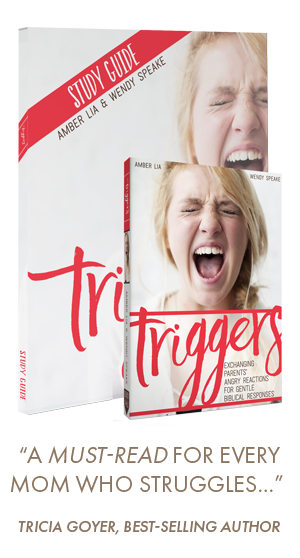 And just recently, I signed a contract with a publisher to write a book about this very topic! We spend our days caring for “our most beautiful creations” but there are other creations we long to pen, sing, paint, stitch and bake. It’s hard to embrace any other dream during this dream-come-true season of mothering. Share one of your dreams with our readers. 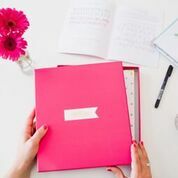 My dream is to build a thriving line of beautiful paper and gift products and to see my products in stores. I’ve come to realize there aren’t many designers doing much with Scripture in the independent stationery market, so I’m going out on a limb here. But I firmly believe there’s a market for special, modern-designed cards to send to a friend who needs her soul watered with the Word. 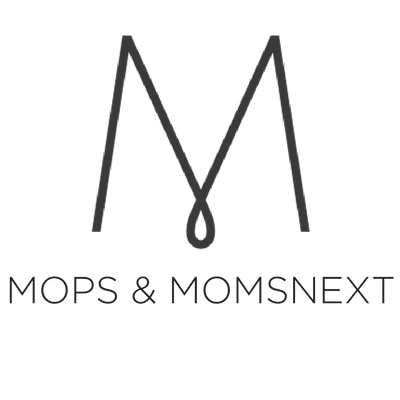 From the outside, it may look like I have a thriving business already, but I still consider it to be in the infant stages, needing a lot of tending and time, being just one step away from not existing at all. I trust God’s timing is perfect. I trust He planted these business dreams in my heart. So I’m also trusting Him with the pace of its growth and the season I’m currently in. 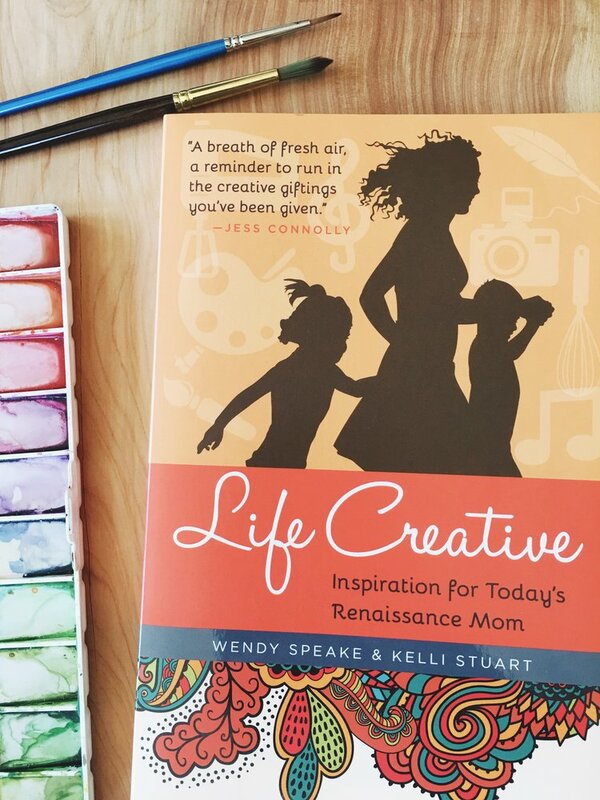 Share with us one of your "creative crushes" - another artistic mom who inspires you and an explanation why. My creative crush right now is Whitney English. Her entrepreneur story is impressive and inspiring. But more than that, ever since Instagram Stories came along, I’ve been watching her, and I love her unaffected personality, her ability to laugh during a live broadcast when her kids act up (something that always makes me sweat), and her down-to-earth nature. I’d love to meet her one day and hear all about her journey as a wife, mom, and business owner. First, let me say I feel completely inadequate to answer this question since I’m in the throes of this tension right now. I think my best piece of advice is to try and look at your children with fresh eyes everyday. Remember that Christian parenting is gospel ministry.You’re tending to their hearts as well as their boo boos. Maybe that perspective will help when you’re interrupted for the 10th time in 10 minutes, or when you can’t seem to complete a project. One other piece of advice is to communicate with your spouse.Spouses won't understand our need for alone time and creative space unless we tell them about it. My husband and I have had many long (tearful - me) conversations about the “need to create” and this awkward tension of (#blessed) responsibilities. He is now my best advocate and problem-solver for finding creative space during crazy weeks. You can’t help someone if you don’t know their needs, and this is a perfect example. And you know what? Those little bits of creative time make me a better mom and wife. Communication is key! My website is krystalwhitten.com. That’s where you’ll find my blog and online shop. If you'd like to give hand-lettering a try, check out my lettering prayer journal. And I'd love to see you over on Instagram and Facebook @krystalwhitten, and I share regularly on there. 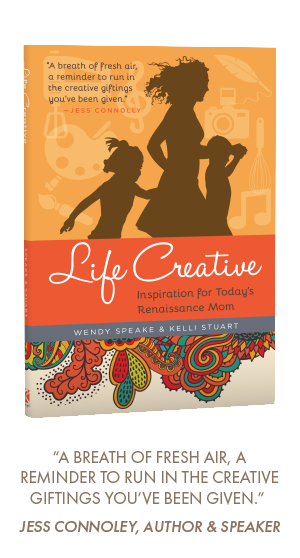 This series was inspired by the book Life Creative: Inspiration for Today's Renaissance Mom, by Wendy Speake and Kelli Stuart. We hope you enjoyed getting to know Renaissance Mom, Krystal Whitten! Make sure to visit her shop. I cannot recommend her cards highly enough! (I bought her Father's Day cards for every dad I know this year!) 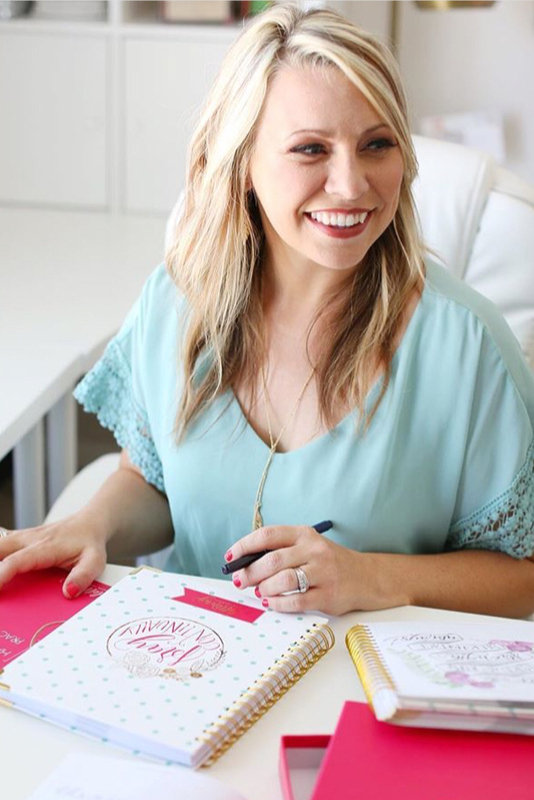 I'm also crushing on her lettering prayer journal. Stay tuned for more "Interviews with a Renaissance Mom" - sign up here so you don't miss this fun and ongoing series!